Starting a dropshipping business is already one of the lowest-cost businesses that you can start. However, imagine getting all of the software that you need to run your business for free? That is exactly the case if you build your dropshipping store on the WordPress platform, install the WooCommerce plugin, and a free AliExpress product importer plugin called DropshipMe. Whether you are on a budget or simply prefer to build out your dropshipping store using WooCommerce, you will be excited about the DropshipMe plugin. WordPress is the software that creates your website. WooCommerce is the software that turns your website into an eCommerce store and DropshipMe is the software that handles your inventory. Some suppliers ship from the U.S.
DropshipMe enables you to easily import selected AliExpress products with clear, already edited titles and descriptions to your WordPress store. Therefore, you no longer have to spend a ton of time researching the best selling products on AliExpress.com. The creators of the plugin have manually selected over 50,000+ of the top-selling and highest rated products on AliExpress. Not only will you save money with this plugin, but you will also save a significant amount of time. Importing products can often be extremely time-consuming. That is because you have to research products within your niche that have a proven track record of sales, have great ratings, and suppliers with great ratings as well. The screen capture above represents a ring that I imported into my own store. 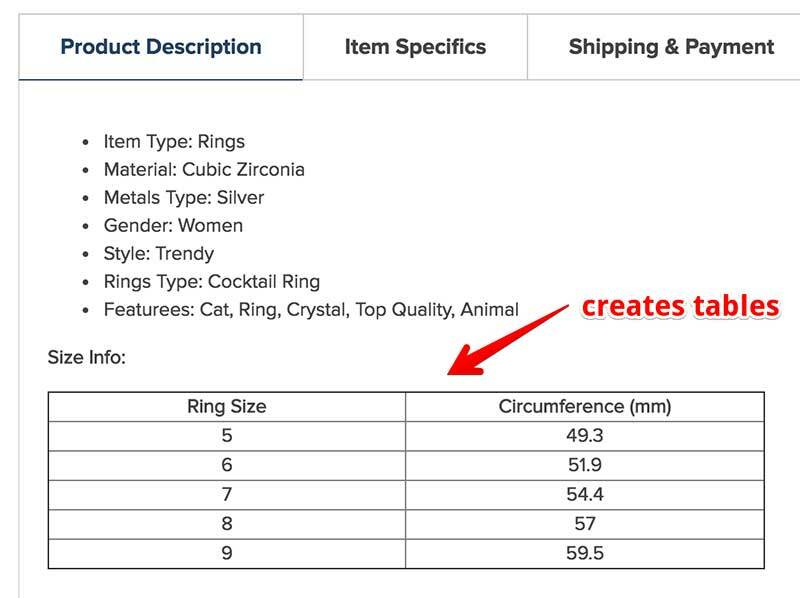 Items such as jewelry or clothing that has sizing variations can take up a lot of time when it comes to editing their descriptions. The DropshipMe plugin has descriptions already edited for you so the table that you see above was already created. DropshipMe is a WordPress plugin so you will need to have your own WordPress website installed on a hosting provider of your choice. In this case, since this post is covering how to create a free dropshipping store, you would want to choose the WooCommerce plugin. However, the AliDropship plugin is an amazing dropshipping plugin itself. It turns your WordPress website into a full-featured AliExpress dropshipping business. Either option would work well with DropshipMe. AliDropship does have a one-time fee of $89 and there is a WooCommerce version of the plugin as well. FYI: the DropshipMe plugin does not work on WordPress Multisite Network, local hosts, or on subdomains or subfolders. In most cases, those are things you won’t need to worry about as you’ll likely use the plugin on your own domain on your own web hosting provider. What Other Dropshipping Expenses Can You Expect? You will need to sign up with a web hosting provider to host your website. There are many hosting providers to choose from. I use SiteGround to host my store. I like them for their superior customer support and reliability. Shop around and ask questions before choosing a service. Ensure that they have the capability to host a dropshipping store. These costs will vary as you can promote your store in a variety of ways. Paid advertising is one way but you also have the option to utilize free options such as posting on social media channels. However, many dropshippers do use paid ads on Facebook, Instagram, Pinterest, and others. There may be other WooCommerce plugins that you are interested in installing that may have one-time or recurring monthly fees. DropshipMe is free to use for your first 50 products (which is plenty for a brand new store.) You do have the option to upgrade your package at any time for a one-time fee. The DropshipMe plugin is extremely easy to use and it is fast. All I do is type in a keyword related to my store’s niche and I’m returned with a ton of products that are ready to import and sell. They even have user reviews imported as well which helps to give your product pages an even more professional look and feel. You can either import a product right away or click “view details” to read the item’s full description. Getting your own dropshipping business up and running is easy and extremely low-cost. Thanks to WordPress, WooCommerce, and the DropshipMe plugin, you have all of the software that you need for free. Sourcing products from AliExpress is also beneficial as their pricing is low which means higher profit margins for you. They have millions of products. There are no requirements or fees to begin selling. Using the DropshipMe plugin makes selecting and importing products into your store fast and efficient. You’ll know that the products the plugin recommends were chosen due to the best sales, reviews, and suppliers. That being said, download a copy of DropshipMe for free and begin importing products into your WooCommerce store. ← Do You Need a Website for Affiliate Marketing?